Goucher Equestrian Team’s “Healing Hooves 2012” Event Website Goes Live! 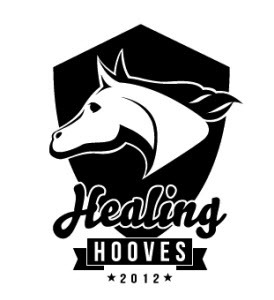 Healing Hooves 2012's new logo, courtesy of Tina Gong. Today, the Goucher Equestrian Team launched a new web initiative for their annual fundraising event ‘Healing Hooves 2012′. The event, which in the past has only been a one-day fundraising initiative transcended its boundaries by offering an online donation method for interested patrons who cannot make it to the official event. Founded as an International Scholars Program project by students Charlotte Kellogg ’12 and Randi Turner ’12, the first official event took place on April 24, 2010 with the aid of 20 volunteers, nine local therapeutic riding programs, and a total of 150 participants. Last year’s event, Healing Hooves 2011 successfully raised just under $2,000 for three local therapeutic centers. It also featured live music and a brand-new ‘no tack’ (no equipment including bridle or saddle) demonstration by Karli Postel ’13 aboard Goucher College’s horse Ghandi. Traditionally, the event has featured a family-friendly fair including riding demonstrations, face painting, grooming stations and other activities to help entertain any children of alumna/alumni attending the event. This year’s event will take place on April 28th from 1 PM until 4 PM at Goucher College’s Equestrian Center.